Anchovies, sardines, kippers; I love them all. I spotted these salted anchovies at Marty's Market in Pittsburgh and had to pick up a pack. 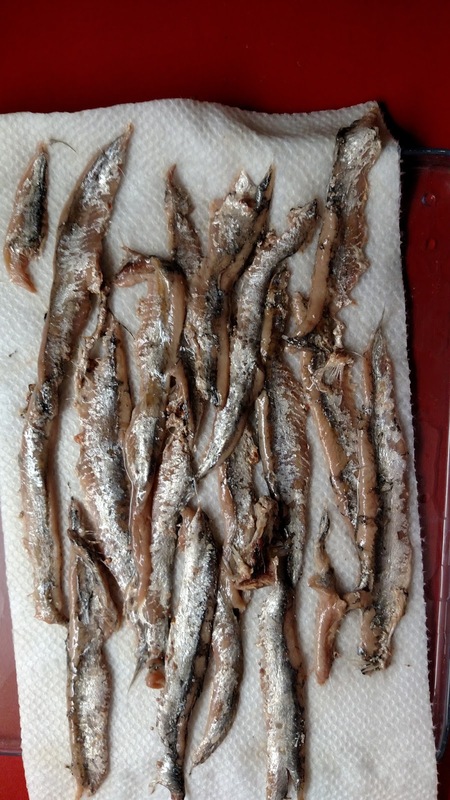 Not only was the brand Ortiz, one of the best producers of preserved fish products available, but they were they ever-elusive salt-packed anchovies. Many old cookbooks extoll the virtues of salt-packed anchovies. They have a firmer texture and a more pronounced flavor since they're not diluted by a neutral packing oil. When you're ready to use them, just rinse off the salt and enjoy as you need them. 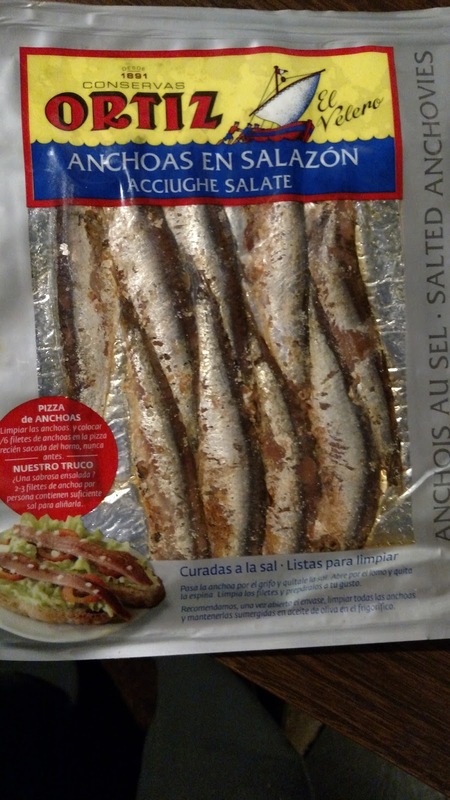 The problem for me is that salt-packed anchovies are very hard to find here in Pennsylvania. Some Italian specialty stores/deli's do stock them, but they're in large tins and the quality is dodgy depending on how long it's been since the tin was opened. Occasionally they'll just be old and mushy. Ortiz solves this problem by giving you a vacuum sealed pouch of salt-packed anchovies that you can prepare at home. Simply open them up, separate the two fillets from the spine, and soak them in a little water to remove the excess salt. Then you can use them right away, or store them in a crock with your personal choice of olive oil. It's one of those product that just seems so simple: pack them in salt and let the consumer prep them at home for a fresh product with a firm texture. And leftovers can be stored under a good quality oil, not some cheap refined oil at a copacker plant. 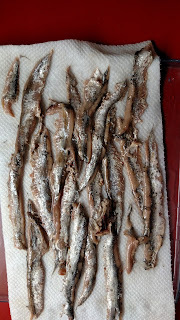 While not for everyone, I love that I could clean and prepare these at home to ensure I was enjoying the anchovies at their peak.